The first day in a long time with moderate temperatures. The day started at the Spring Street Studio. I've been influenced by Tom Thorspecken's new book - "Urban Sketching the complete guide to techniques". Instead of sketching the model I tried sketching the Studio itself. We went from short lively quick poses to slow long poses - and none of it mattered. I kept steadily working on the picture of the room. It was a very interesting exercise and taught me a lot. I'm certainly going to try this again. We explored the walkways with rain forest all around us. It's hard to notice the wildlife at first, all though it's easy to hear them. Then after awhile you realize the room is teaming with life, they're everywhere, in the foliage, up in the trees and flying back and forth. And, of course, nothing is standing still and posing. So all you can do is quick impression of everything jotting down colors and hoping for the approximate posture. The mammals were a little slower and more cooperative. This Coati spent considerable time examining an empty bowl, maybe reminiscing about it's last meal. We camped out and waited for feeding time at the sea lion pond. I believe the trick to sketching seals is to capture the highlights of their wet coats. ( Are sea lions and seals two words for the same mammal?) Unfortunately, the sketch above does not do that at all, but when I go back to the zoo for another attempt, I'm going to spend time trying to figure out how to capture those highlights. The zoo keepers hand-fed the seals and played games with them. They explained that in the process they were examining how vigorous each seal was behaving, trying to spot any early signs of illness or injury. By the time I finished sketching the zoo keeper above the seal was long gone, which is why the seal looks like a pointed rock instead of something living and excited about being fed. This last sketch started out with seal getting fed, and ended up at a duck pond. 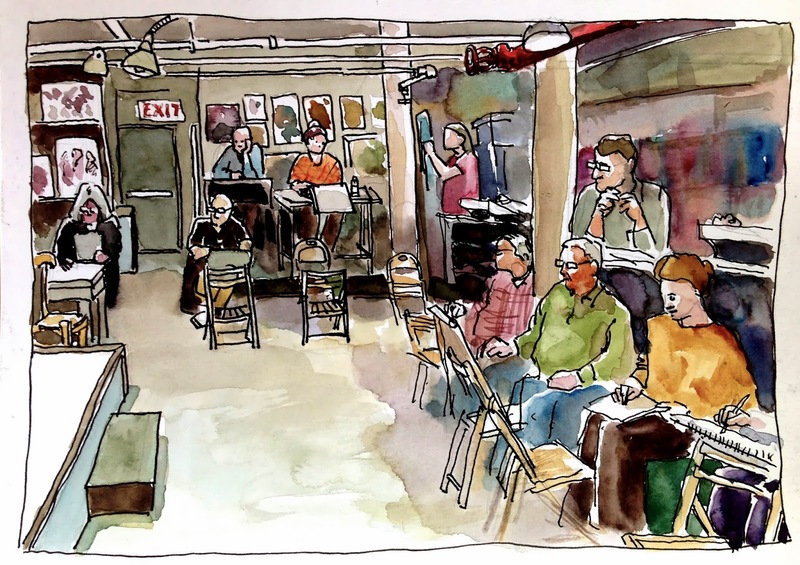 Great zoo sketches and I love how you did the room at the studio with everyone at work. I feel like I've missed a lot. Hope to meet up with all of you soon.